Just a guess, but every time I drive the car or the tractor out to the pasture one chicken takes a liking to being “queen of the castle”. Perhaps the views are better? Happy hens expressing themselves is what we are all about, free 24/7 on bio diverse pastures equals exquisite tasting eggs. Its simply Nutrition by Nature! First it was Tom, who worked on his own from 10 months old, learning his trade as a Livestock Guardian Dog and when things got busy along came Ruby. Ruby was a rescue dog from Maremma Rescue Victoria. Gentle and shy she learned alongside her new best friend Tom. Together that have kept the chickens safe working very well as a pair. And Banjo makes three. Banjo is another rescue dog who was left at a council in country Victoria. Now re homed at Adelaide Hills Pastured Eggs we are delighted to have such a gentle and fun loving boy looking after our girls. It was all systems go at his first induction day being shown the ropes by Tom & Ruby. He’s young and still has a lot of training to do but feel he’ll fit in perfectly with our now older and seasoned Maremma’s. Maremmas work well in a social group and having Banjo on board will mean that extra security for our chickens. Banjo passed the Tom & Ruby inspection test and were out patrolling the paddocks together as a group the same day. Banjo couldn’t be happier, 80 acres to roam over and livestock to protect. We are over the moon to say Banjo makes three. Tom & Ruby work 24/7 looking after the girls, so sometimes they grab a quiet break to sit back and relax. Our pastures are lush and green (try spotting the chickens in the long grass) and full of nutrients….just like our eggs! If you live in or near Stirling, life just added a smile to your day. Sonny and the Team at Stirling Fruit Mart are as proud as punch that they now have Adelaide Hills Pastured eggs available on the shelves. You see finding true “Pasture Raised” eggs is a tad difficult but once you’ve tried them there is no going back. So call in and see Sonny and the friendly staff at Stirling Fruit Mart and pick up some local, pasture raised, exquisite tasting eggs, you’ll be amazed at the freshness and taste. If your new to pastured eggs and want to know what all the fuss is about then we have inserted a flyer inside the cartons to explain the differences and you can see and read up on where your eggs come from. Being LOCAL means a lot especially in the Adelaide Hills. We are so passionate about our eggs we even take the time to get our pastures analyzed for the nutrient content, so you can be assured that the eggs you eat are of the highest quality. Its simply nutrition by nature. Consumers, albeit discerning consumers are the winners when it comes to Pastured Eggs. They are getting what is effectively what consumers believe is a ‘true’ free range egg even though nowadays consumers do not trust the term free range. The ABC has hit the nail on the head as consumers are flocking (pardon the pun) to Pasture raised eggs for consistency and quality. 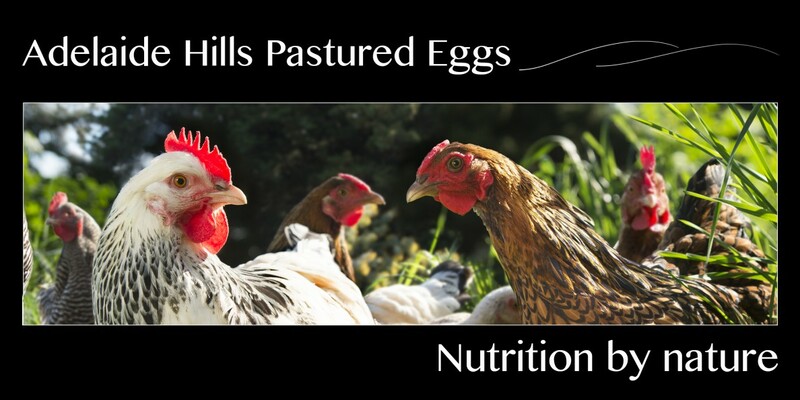 As a pastured eggs producer we go that extra step and have our pastures analyzed by the Southern Cross University to ensure that the nutrition is there for our hens. We keep our stocking densities very low which simply makes good farming sense. Our pastures are regenerating and improving all the time rather than being treated as a resource to be used up and depleted. So when choosing quality eggs make sure you go for pasture raised as being the best of the best. At Adelaide Hills Pastured Eggs its simply Nutrition by nature. Pastured Eggs are back on the shelves at Hahndorf Fruit & Veg…. Angelo and the team are smiling from ear to ear now that they have Adelaide Hills Pastured Eggs back on the Shelves for their customers. It’s been a while coming but we now have Nutrient Dense pastured eggs on the shelves at Hahndorf Fruit & Veg for the customer who just can not make it to the Farmer’s Market on a Saturday. So you can shoot over to Hahndorf (or call in on your way home) and grab some of the best tasting eggs ever. We are honored to have businesses like Hahndorf Fruit & Veg that promote locally grown produce. When you grab a carton of Adelaide Hills Pastured 700gm eggs you know that they are nutrient dense, sourced locally and have an exquisite taste, Breakfast just couldn’t get any better. Its simply Nutrition by nature. Up until now we have collected, polished, candled and weighed every egg by hand. This is a time consuming process usually done late at night or just before the markets to make sure our customers are getting the freshest eggs possible. So don’t you think we are a tad eggcited (sic) with our new egg grading and candling machine. . The kids are excited at how easy the new grader is to use. The weather has been a bit wet, but in amongst all the rain our new girls are getting rainbows and have even started laying eggs. The pastures are green and packed full of all the nutrients our chooks need to produce nutrient dense eggs. Its simply nutrition by nature. As always Tom & Ruby are close at hand to make sure the girls are safe.